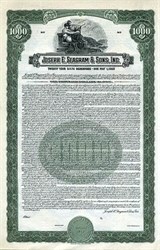 Beautifully engraved Specimen certificate from Joseph E. Seagram & Sons, Inc. printed in 1945. This historic document was printed by Hamilton Bank Note and has an ornate border around it with a vignette of 2 allegorical figures sitting and looking out over a river running through the mountains. This item over 62 years old and has 40 coupons attached on the right side (not shown in scan). The Seagram Company Ltd. was a large corporation headquartered in Montreal, Quebec, Canada. It was the world's largest producer of distilled alcohol beverages, and towards the end of its independent existence also controlled various entertainment and other business ventures. The Seagram assets have since been acquired by other companies. In 1857, a distillery was founded in Waterloo, Ontario. Joseph E. Seagram became a partner in 1869 and sole owner in 1883, and the company was known as Joseph E. Seagram & Sons. Much later, Samuel Bronfman founded Distillers Corp., Ltd., in Montreal, which enjoyed substantial growth in the 1920s, in part due to Prohibition in the United States of America. In 1928 the Distillers Corporation acquired Joseph E. Seagram & Sons, and took the Seagram name. The company was well prepared for the end of Prohibition in 1933 with an ample stock of aged whiskeys ready to sell to the newly opened American market, and prospered accordingly. Thus despite its earlier Waterloo history, the Seagram name is most closely associated with the Bronfman family. At the initiative of Edgar Bronfman, Jr., grandson of Samuel Bronfman, Seagram branched out into the entertainment business in the 1990s with aggressive purchases including Universal Studios, MCA, PolyGram Records, and Deutsche Grammophon. Seagram also controlled a number of Universal theme parks. In 2000 controlling interest in Seagram's entertainment division was acquired by the Vivendi Group, and the beverage division by Pernod Ricard. Noted brand names owned by Seagram included Chivas Regal whisky and Tropicana fruit juice, today owned by Pernod Ricard and Pepsico, Inc., respectively. The Seagram brand name lives on in Pernod products such as "Seagram's Gin" and "Seagram's Coolers".